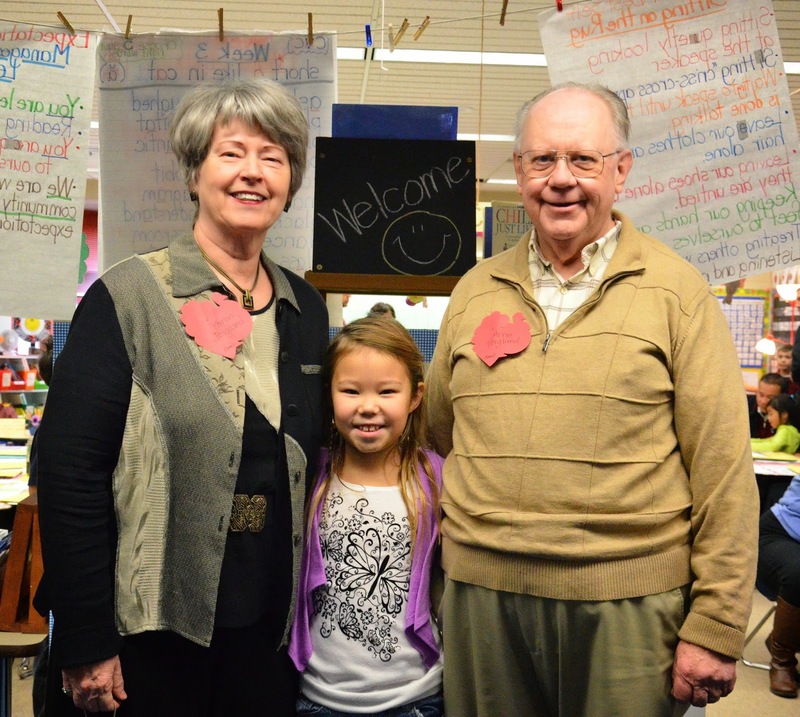 Today was Grandparent's Day for the second-graders in the girls' school. 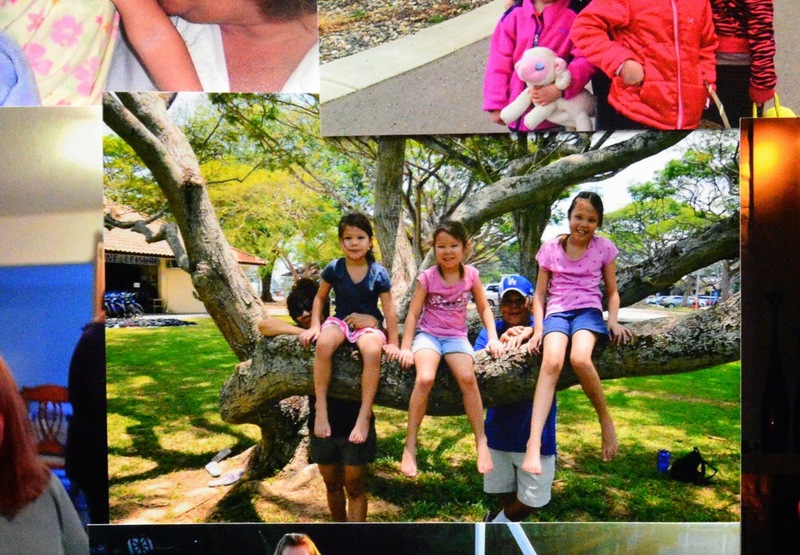 Photo of Jenna (and her sisters) with her maternal grandparents on the school notice board. The kids sang to them in a concert that was alternately a rib-tickler and tear-jerker. The parents were invited to the preview the night before. "Bring tissues." Emily reminded me, and then kept watching my eyes throughout the performance to catch me weeping. Today, however, was the Actual Concert, presented to the Actual Grandparents. I volunteered in Jenna's classroom after, taking portraits of her classmates and their families who had been invited to visit. I am disastrous with indoor lighting but we made do. And while I was being busy, desperately composing and focusing and snapping, I stole glances at Jenna's teacher and watched her enjoy her students and their enraptured guests. For once, I wasn't jealous of her teacherhood or missful of my own that I'd left behind when I married and had children. Maybe the intricacies of my own classroom experience is a selectively-repressed memory, or maybe teaching senior high is completely different from teaching elementary school, but teachers sure do A LOT these days. So much of it isn't actual classroom instruction - it's nurturing outside the curriculum, building relationships with families, celebrating the children for who they are and not only what they accomplish. And they do it day after day, year after year, greeting a fresh batch of kids each fall and sending them off the following spring. Those are a lot of hellos and goodbyes bookending a ridiculously short span of time filled with all manner of educational obligations. 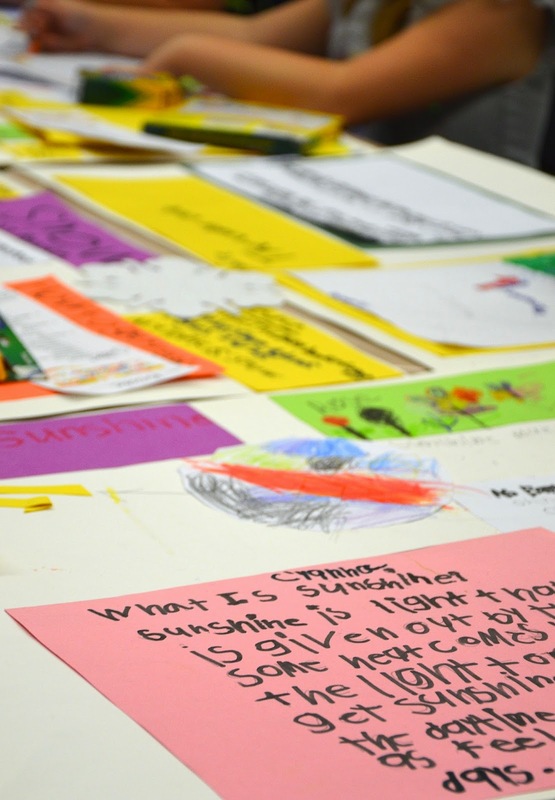 But they do it, and manage to also throw in stuff that personalizes that experience with each child, making them feel clever and capable and worthy and excited about their future. One reason - apart from sheer indolence, I mean - for not returning to work now that my kids are "grown" is having the flexibility to pop into their classrooms, lunchrooms and playgrounds and learn the names of their classmates. I want to be part of their formal learning and early social adventures. I also want to support their teachers by helping with the busy stuff that isn't curriculum but may be just as necessary in their work. And lately, that has been taking photos. At their teachers' requests, I've taken photos, both candids and portraits (and by "portraits" I mean "Hello, family! Stand against that wall and smile! Quick, before the kindergarteners walk past us again!"). It is hilarious because I feel horribly inadequate, seeing as I don't even know the manual settings on my camera well (or at all). But that is the curse of carrying around a hulking DSLR: people mistakenly think you know what you're doing. Still, it helps the teachers, because if not for volunteer photographers, it would be they who'd be running around like chickens with their heads cut off, directing crafts and fielding questions and making small talk, while also trying to capture the essence of the day with their cameras (probably smeared with Elmer's glue). I like to think that because I - and other lens-toting parent helpers - are doing the memory-collecting instead, the teachers can visit with family guests and enjoy another side of their students as sons and daughters, grandsons and granddaughters. When the event is over, they always thank me as if I've just presented them with a year's supply of Nutella. I resist the urge to mumble, "Er, wait till you actually see the photos- I think I got the exposure totally messed up" and instead hug them back, saying - quite honestly- that I was happy to be useful. And that's nothing compared to you teaching and loving my children, making them look forward to getting on the school bus each morning, and helping them not fear how much they don't yet know, I want to add, if I could only find a way to make it not sound patronizing. Way back when I was myself teaching Other People's Kids, if you'd told me that someday, I'd be wielding a camera to help other teachers do their job, I'd have snorted and said As If. Who takes photos for teachers? Or helps brand new itty bitty kindergarteners open their milk boxes? Or locates the right buses on field trips? How does that enable a teacher to cram more curriculum time into their school day? Or increase mean exam scores? Or up the national ranking of the school? As If indeed. We were efficient in Singapore and focused to a fault, yes. But maybe we kinda missed the point, too. So here I am - sitting in front of the computer, editing a batch of digital images of kids with proud faces, showing off their classroom, their teacher and their literacy to family deeply invested in their success. It isn't standardized scores or scholarship applications or spelling bee awards, but it's education at its most fundamental. And I helped by taking photos. It's so important for the teachers to have supportive families and it's so important for your kids to see you in their classrooms and at school. I feel very lucky to be able to volunteer so much time in my daughter's school. It's warm and fuzzy all around! !